Reel 'em In Lobster Potty slot maybe a follow up to WMS' Reel 'em In Big Bass Bucks, although this time it is Barcrest's turn to develop the game, although it has more similarities with the arcade hit Reel King. We have a transparent set of reels over a cartoon undersea background and spin to some rather inane and jolly music with some happy lobsters (why so happy?) waving to us above the reels, although to be fair they may make you happy later on! These fishermen leave their lobster pots on the seabed hoping that overnight they will have trapped one of these rather pricey crustaceans, so will we reel in some riches or will our bankroll sink down to the ocean floor? A standard 5x3 grid awaits us because there are 20 paying lines here with stacked icons available. The game logo pays us 25x bet for a full 5-of-a-kind then Orange Fish 10x, Yellow Fish 5x with four card values paying either 3 or 2x for the full line. Wilds only appear on reels 3, 4 and 5 though unless we use the 'Big Bets' option; yes, this another BBB (Big Bets Barcrest) which like Barkin' Mad and Monopoly Bring The House Down offers us the chance to stake insane amounts to make the feature more likely! There are no random in-play events here but two features can be triggered by all 5 reels turning to sand and that's why I referred to Reel King which chimes once for each reel which will trigger the feature. So if you hear the chime on all 5 reels stopping your background will turn to sand and you will trigger one of two features. Most times you will see one to five reels become 'Fishing Reels' which will spin in fish of various values from 2.00 to 50.00 until an old boot appears. Each time the reel(s) stop the manic fisherman to the right of the game will reel in your catch until the boot appears and that reel stops spinning. You can win a maximum of 100.00 on any reel thus matching the game's maximum 500x stake potential for a full screen of game icons should you have all 5 reels in action. If you do see all 5 reels turn to Fishing Reels you will in most cases be getting the 500x bet jackpot, the same as the old arcade game. Usually it's just one reel which pays 30-60.00 most times. There is an internal set of jackpot awards of 100.00, 200.00 and 500.00 which are held by the Bronze, Silver and Gold lobsters happily waving to you over the middle three reels. 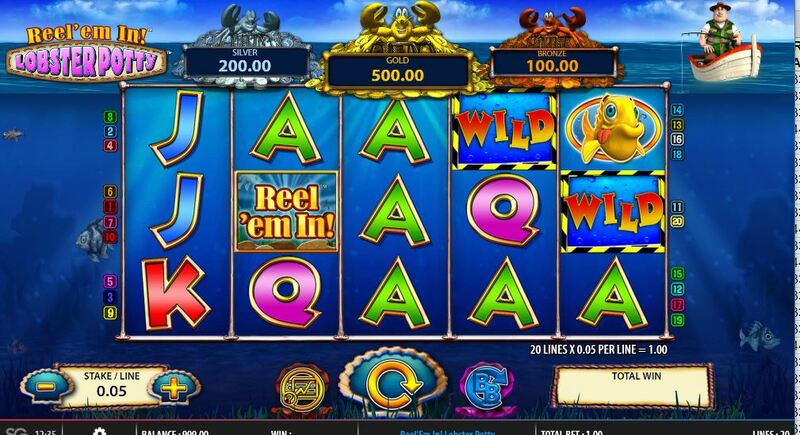 If you trigger this instead of the above and usual feature, only reel 3 will spin with the 3 different Lobsters on it and you will see one of them land in the centre, thus awarding its respective jackpot amount. Instead of paying 1.00 (0.05 per line minimum stake) you can pay either 20.00 or 30.00 for a series of 5 Big Bet spins. The usual pays are doubled thus 1000x bet is possible for the full screen of icons and and on the 20.00 Big Bet there are far more Wilds on the last 3 reels. If you bet 30.00 then this applies but randomly the Shark can appear and bite a symbol anywhere on all 5 reels and it will turn into either a 2x, 3x, 4x, 5x or 10x Wild. Naturally in both Big Bet options the bonus round is triggered far more frequently. Reel' em In Lobster Potty slot is a reasonable game with decent graphics and animations but has the caveat of higher RTP for higher stakes which encourages use of the potentially expensive and possibly irresponsible Big Bet system. You can play at 1.00 per spin and will only get 94.00% but at 20.00 or 30.00 the RTP rises to 96.00% and 98.00% respectively. The returns in the Big Bet games are seldom more than 200.00 which although seems good compared to a 1.00 bet is poor when risking 30.00! If you can afford Big Bets then you have high-return slot, if not you have a below par 94% game which isn't particularly good. I'll be casting my line elsewhere rather than taking my chances on this seabed.